Show up. Dive in. Persevere. Last night, President Obama eloquently expressed one of the wonderful things about being in a democracy (or at least as close to a democracy as we will achieve). We are free to engage. We are free to participate. Yes, by all means, if something rankles you or angers you, or you think that you can do better – do something about it! Engage! I whistle that tune to anyone who will listen to me. Ask my kids. So of all of the words that the President said last night, these words about civic engagement and the responsibilities of citizenship – well they rang the clearest for me. Thank-you, Mr. President. Ultimately, that’s what our democracy demands. It needs you. Not just when there’s an election, not just when your own narrow interest is at stake, but over the full span of a lifetime. If you’re tired of arguing with strangers on the internet, try to talk with one in real life. If something needs fixing, lace up your shoes and do some organizing. If you’re disappointed by your elected officials, grab a clipboard, get some signatures, and run for office yourself. Show up. Dive in. Persevere. Sometimes you’ll win. Sometimes you’ll lose. Presuming a reservoir of goodness in others can be a risk, and there will be times when the process disappoints you. But for those of us fortunate enough to have been a part of this work, to see it up close, let me tell you, it can energize and inspire. … hmm… Not a bad idea. The Mayor of Chicago has sent a letter to the TD Bank, and other financial institutions to withdraw Smith and Wesson’s revolving line of credit. This request is intended to pressure Smith and Wesson and other gun makers to quit fighting against stricter automatic weapon controls. I wonder how the banks will eventually respond to this. Unfortunately, the revenues accrued through increased sales might render this moot. But given the opposition that the pro-sanity lobby (anti gun lobby) is facing down south, any help would be valuable. Seems there is a teacher’s strike going on in Chicago. And it is getting nasty. 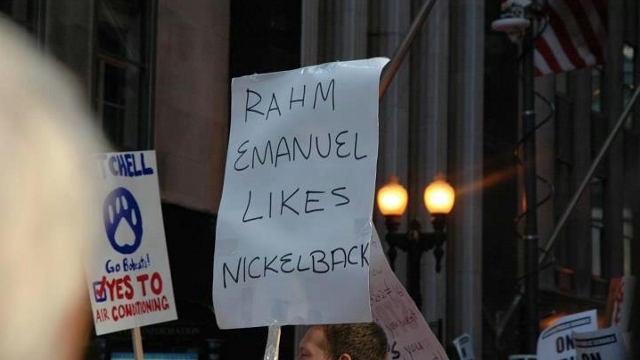 Civility has disappeared in Chicago Teachers Union protests,” says Daniel Strauss, who snapped the pic. Make fun of the mayor’s mother, declare him worse than Hitler, plant evidence that he’s having an extramarital affair. But calling him a Nickelback fan? Unacceptable. Too far. Way too far.